Join the staff at Choo Choo Diving & Aquatic Center for a truly unique experience! A pool party is the perfect choice for a no-hassle birthday! 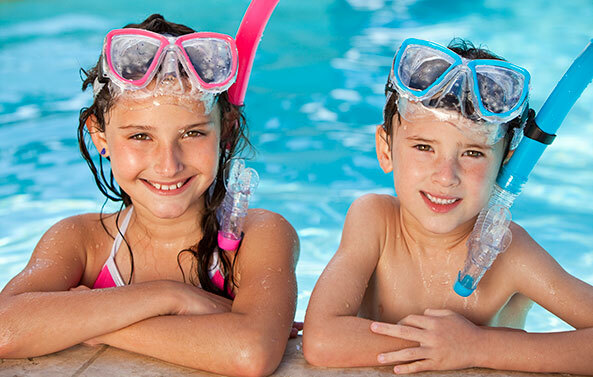 Our swim party is a great choice for kids of all ages and our SCUBA party is sure to be a hit for kids 8 years of age and up! You will have private use of our pool area. For SCUBA parties, we supply the tanks, regulators, and true “kid-size” equipment… everything you need to party in another world! SCUBA Party – A unique experience that will have the kids talking for months! Reservations are accepted up to 12 months in advance with a $75 deposit! Prices are subject to change until deposit has been received. NOTE: All participants must sign a waiver prior to participating in swim or SCUBA parties. Waivers for participants under the age of 18 must be signed by a parent or legal guardian (not just another family member). SCUBA participation requires a completed medical questionnaire. Any “yes” responses require the form to be reviewed and approved by a physician before the party. Classroom Use: If you would like to use the classroom, there will be a $25 cleaning fee & upon availability of classroom.